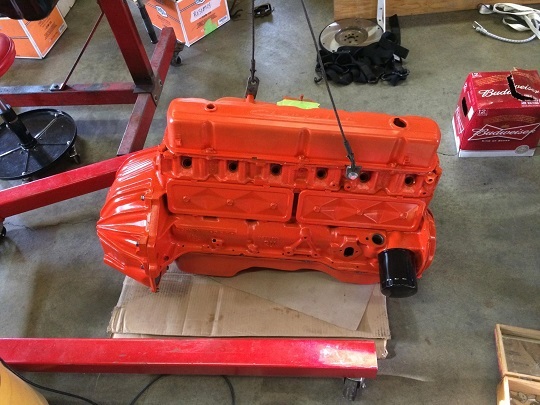 Durable, affordable, and powerful for their day, early Chevy six-cylinder engines are often referred to as the "Stovebolt" or "Stovebolt-Six" because of the 1/4"x20 slotted-head stove-bolts on their valve cover, lifter cover and timing cover. Although only engines from 1929 through 1962 had the slotted-head bolts, the nickname eventually included all inline six-cylinder Chevrolet cars and trucks. Chevrolet introduced their new inline-six engine to the market in 1929. The original bore and stroke was 3.3125" by 3.75", making 194 cubic-inches. Although the more common flathead engine design was simpler and cheaper to manufacture, the Stovebolt-6 was a more complex, overhead-valve design. The 194 Stovebolt engine featured a forged-steel crankshaft and connecting rods, with three main bearings and cast-iron pistons. These engines were not named Stovebolt by Chevrolet, they gained that nickname later on. With improvements in both durability and performance, an updated 216ci engine was introduced in 1937. This second-generation I-6 had a 46-pound crankshaft that was statically and dynamically balanced. The drawback to the 216 engine was it did not have pressurized rod journal oiling, and their Babbitt bearings were not noted for their longevity. The 216 Stovebolt-Six was last offered in 1952. In 1953, Chevrolet discontinued the 216 Stovebolt in favor of the 235ci engine, taken from Chevy's "Load-Master" truck series. Improvements included stronger crankshaft and connecting rods, aluminum pistons, and full-pressure lubrication. All pre-1953 engines were splash-oiled Babbitt bearing engines. With 7.5:1 compression ratio, horsepower rating for the 235ci engine was 112 at 3,700 rpm. 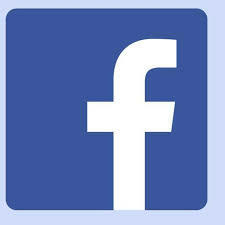 Torque was 200 pound-feet at 2,000 rpm. In 1950, the 235 Stovebolt with hydraulic lifters was offered with Chevy's new Powerglide automatic transmission. Engines mated to manual transmissions kept using mechanical lifters. Starting in 1956 and until 1962, all 235 Chevy engines in passenger cars had hydraulic lifters. 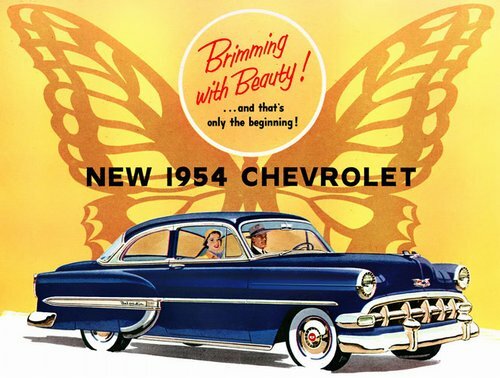 All 1953 Chevys (except a few fleet vehicles) came with a 235ci Blue-Flame Six, rated at 108-hp with standard transmission. When backed with a Powerglide automatic, power output was 115-hp. Engines in the Powerglide-equipped models had a full-pressure oiling system. At the Carrera Panamericana road race that year, driver C.D. Evans drove a Stovebolt-powered Chevy 210 to victory in the Light Stock Car class. As the 235ci Stovebolt was Chevy's only engine, it powered the first Corvette in 1953. The engine was a higher 8.0:1 compression featuring a high-lift, long-duration camshaft with solid lifters. Called the "Blue Flame Six", it was painted blue and mated to the Powerglide automatic transmission. Power output was 150 horsepower at 4,200 rpm. The 'Blue Flame' moniker had been used in Chevrolet advertising since 1934. For the 1953-1954 Corvette, the Blue Flame Six featured three side-draft, single-barrel Carter Model YH carburetors, each carb feeding two cylinders. Dual valve springs were added to help achieve higher RPMs, and split exhaust manifolds rounded out the package. 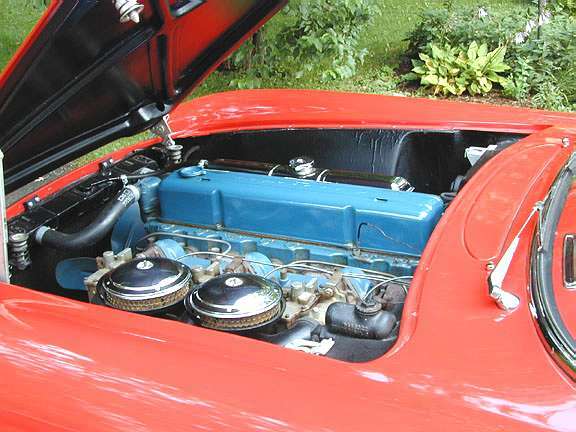 The Blue Flame Six was the only engine available in 1953 and 1954 Corvettes, and was the base engine for 1955 when the small block V8 was introduced. The Stovebolt-6 was Chevrolet's sole engine from 1929 through 1954, then relegated to base engine starting in 1955, when the small block V8 was added to the lineup. The 235 version was produced until 1962, and considered one of Chevrolet's best engines. 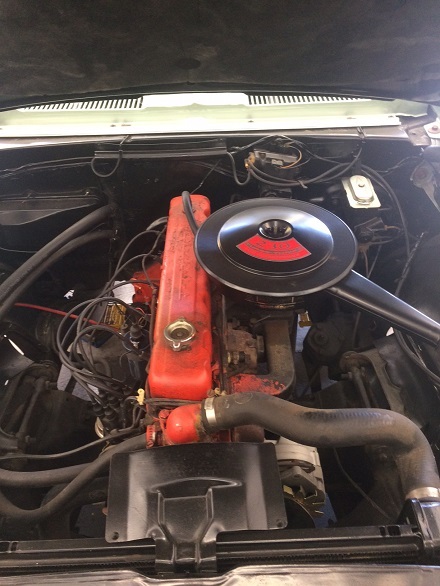 Starting in the mid-fifties, Chevy inline six-cylinder engines had revised bell-housings, making transmissions and starter motors interchangeable between the I-6 and V8 engines. By the mid-sixties, not many car buyers were concerned about the economy of a six-cylinder engine, although Chevrolet continued to sell variants of the Stovebolt-Six. In 1962, the 235ci engine was replaced by a third-generation 230ci straight-6. Part of the re-design was to share parts with the small-block V8 engine. The 230ci six was the base engine for 1967 through 1969 Camaros. It was also found in Chevelles and El Caminos, as well as several Oldsmobile and Pontiac models. Improvements over the old engine included a seven main-bearing block, up from four in the previous version. Displacement later increased to 250ci, with production continuing until 1988. 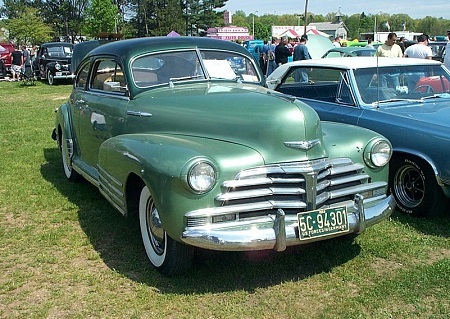 The 194ci six was available in early Chevelles and Novas, and also some Chevrolet and GMC trucks. It was not offered in the 1/2-ton C/K series trucks. Bore and stroke was 3.56" in and 3.25". Between 1975 and 1984, an integrated cylinder head was produced for the Chevy straight six. This was an intake manifold and cylinder head cast as a single piece, presumably for cost savings. The extra weight sometimes resulted in warpage, and it was common practice to swap an earlier, non-integrated head in place of the integrated head. 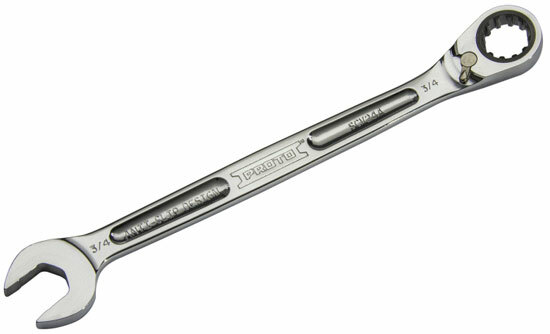 The Stovebolt-6 is one of the most durable engines ever built, simple and efficient, and capable of making more power. They are easy to work on, easy to maintain, and can be dressed up quite nicely with a finned valve cover, triple carbs, and chrome air cleaners. First introduced in 1929, the Chevy overhead-valve inline six-cylinder engine remained in active production until 2001, a total production span of 72 years.